John Stott was a giant in the land of Christianity as he wrote books, Bible commentaries, and delivered powerful sermons in London and abroad for years. His influence was great during his life and continues to this day. In a small book titled The Preacher’s Portrait (a book about the New Testament’s view of the preacher and his task), Stott acknowledges in the preface that he is not writing the book to speak to the issues of preaching techniques, the craft of the sermon, or communication in general. He goes on to say, “I do not doubt that there are methods of preaching which need to be learned in our day, when the gulf between the church and the secular world is already so disastrously wide that few bridges are left by which the two remain in contact.” The part I would like to focus on is what I have italicized in the quote. Stott published this book in 1961, so we can suppose how much wider the gap between the church and the secular world may be in 2014. Things change quickly in this world. This seems especially true for American culture which is rapidly changing into what many people have deemed a “postmodern” and/or “post-Christian” society. There now seems to be no denying that the American culture no longer values what biblical believers value. This is something new in our nation’s history. So, here is the question that I want to propose from Stott’s statement, what bridges are left from the church to the world? I think that, theologically speaking, God, in His sovereignty, is required to safeguard some bridges so that the Gospel mission and kingdom of heaven may advance. The Lord’s mandate at His departure was to go into all the world and make disciples (teaching and baptizing them). In order for that to continue through history until the Lord returns, then there must continuously be some bridges or a bridge for the church to reach the world. I will offer one of those bridges in this post (and maybe a few more in future articles). One bridge that seems to still be intact is the fact that almost everyone can and will acknowledge that there is something “wrong” in this world, that there is something that is just “not right.” I mean, look around. Even if someone is not working under a biblical worldview, or any religious worldview, one can easily admit that sickness, suffering, hunger, hatred, and the like are not right. Things are broken. Things are disconnected. Things are flawed. Christianity is able to name the problem, diagnose it, and offer a solution, an eternal solution. What is the name of the problem? The problem in this world is “sin.” How can this be diagnosed? Without going into too much detail in this brief post, the Bible diagnoses our problem. From the first couple of people until now, humanity has rebelled against its Creator. We have all sinned, that is, we have missed the mark that God has set and fallen short of the glory of God and, really, the glory that God set out for humanity. A great chasm now separates each human and God, unless something is done which leads to the next part of the knowledge that the Bible offers on these things. What is the solution to the problem of sin which has been named and diagnosed by the Bible? God has offered one, and only one, solution to the sin-problem, namely, Jesus Christ. This is where the Good News of Christianity becomes most different from any other religion or faith/spiritual system on earth. In fact, the message of what Christ has done is exclusive. The problem is sin. The atonement is the sacrificial death of Jesus Christ. This death is a once-for-all (for all people for all time) payment for sin. If offers atonement, forgiveness, reconciliation, eternal life (life in God’s presence without the negative effects of sin that we experience in this life), and much more. Other groups/religions may come close to naming the problem, but they will struggle in diagnosing the problem, and worse, they offer no atonement for sin. Are you really willing to face Almighty God on the day of reckoning hoping that your good will outweigh your bad? Christ has offered Himself up in your place. He has borne the penalty for your sin in your place as your substitute. There is no more glorious message. Not only has He died to pay our debts, but He has been raised from the dead to never die again. He lives forever as Savior and Lord. He will one day break into human history again to judge the living and the dead. When He returns all will bend their knees and confess with their tongues that Jesus Christ is Lord. How wonderful it is to already willingly do so! What is the bridge we have proposed to connect the church to the world? The bridge that has been shown here to be of use is to point out the fact that there is something "wrong" in this world. We believe that most folks will agree, and this will open the door to a more meaningful conversation about big issues. Are there any other bridges that you can think of that connect the church to the world? 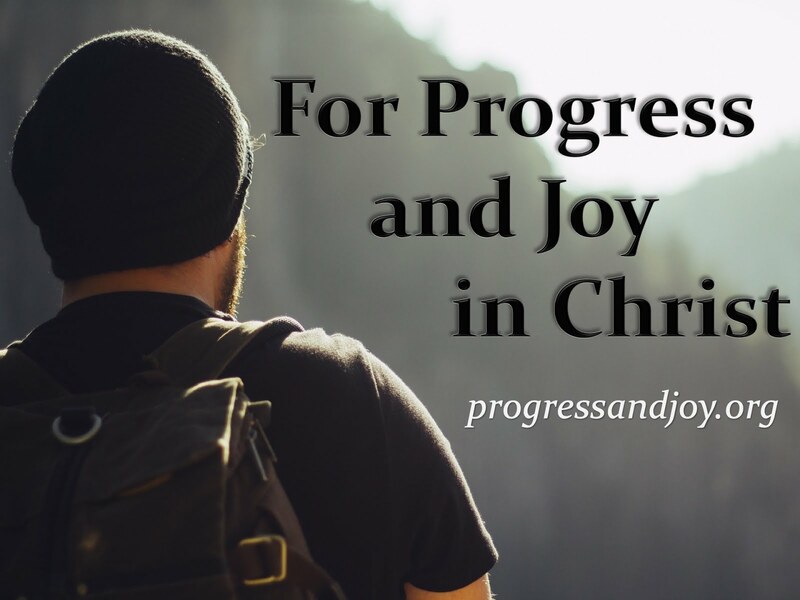 If so, post them on the Progress and Joy Facebook page. If you would like to talk to Wesley about salvation and/or the Christian life, please send him an email.